Jill is a sought after public speaker, delivering keynote addresses and acting as a master of ceremonies at a range of conferences and public events. She has given talks in the corporate, university, school and not-for-profit sectors, and is just at home in large scale auditorium as she is in a more intimate setting. Warm, funny and engaging, Jill knows how to command a room and tailors her presentations for the unique needs of her audience. As a presenter with The School of Life, Jill hosts in-conversation events with high profile leaders and inspiring thinkers who are working towards social change. 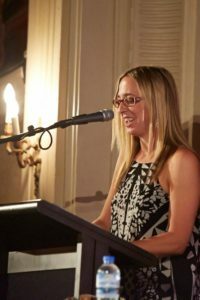 She has appeared at The Wheeler Centre, Women of Letters and writers festivals and bookshops all over Australia. Join ABC Radio National's Paul Barclay who is in-conversation with Jill Stark at the launch of Happy Never After. The School of Life presents best selling author Johann Hari in conversation with Jill Stark speaking about mental health and human connection. Jill Stark, Jenny Valentish and Chris Raine discuss drinking as part of Australia's national and cultural identity.